Officials in Japan have now admitted that the Fukushima-Daiichi radiation release was much higher than initially reported, and now we are hearing that the amount of oceanic pollution is also in dispute. This means that every computer model based on the bogus claims of TEPCO and the Japanese government are inaccurate and misleading. A very desperate TEPCO is now attempting to build an underground ice wall to contain leaks. TEPCO’s claims are not to be trusted. Their lies are well documented, and their numbers are speculation. The level of radioactivity of the water. Without these variables, scientists model “best guess” scenarios which may be misleading to government leaders who make decisions based on their estimates. What we do know is that massive amounts of radioactive material are making their way across the Pacific ocean, and that the greatest threat to life worldwide comes from bioaccumulation (also known as biomagnification). The idea is simple, plankton eat the Cesium-137, shrimp eat the plankton, fish eat shrimp, and finally we consume a fish loaded with radioactivity. Even though the nuclear industry’s perception managers are working overtime to ensure the public will never be able to point the finger squarely their way, the entire world has been negatively affected by the March 11, 2011 meltdown of the Fukushima-Daiichi nuclear power plant. Listen to my 3 hour discussion on the public relations side of this debacle. Many blogs and social media users posted the following NOAA tsunami energy plot map, erroneously claiming (as did I, a year ago) that it was a model of Fukushima-born Cesium-137 crossing the Pacific ocean. Now that we’ve cleared that up, can we find an actual model of Cesium-137 crossing the Pacific please? To replace the improperly over-used image above, I created the following image from a video presentation in the research linked below. Behrens, Erik, Schwarzkopf, Franziska, Lübbecke, Joke and Böning, Claus W. (2012) Model simulations on the long-term dispersal of 137Cs released into the Pacific Ocean off Fukushima Environmental Research Letters, 7 (3). 034004. DOI 10.1088⁄1748-9326/7/3/034004. A sequence of global ocean circulation models, with horizontal mesh sizes of 0.5°, 0.25° and 0.1°, are used to estimate the long-term dispersion by ocean currents and mesoscale eddies of a slowly decaying tracer (half-life of 30 years, comparable to that of 137Cs) from the local waters off the Fukushima Dai-ichi Nuclear Power Plants. The tracer was continuously injected into the coastal waters over some weeks; its subsequent spreading and dilution in the Pacific Ocean was then simulated for 10 years. The simulations do not include any data assimilation, and thus, do not account for the actual state of the local ocean currents during the release of highly contaminated water from the damaged plants in March–April 2011. An ensemble differing in initial current distributions illustrates their importance for the tracer patterns evolving during the first months, but suggests a minor relevance for the large-scale tracer distributions after 2–3 years. By then the tracer cloud has penetrated to depths of more than 400 m, spanning the western and central North Pacific between 25°N and 55°N, leading to a rapid dilution of concentrations. The rate of dilution declines in the following years, while the main tracer patch propagates eastward across the Pacific Ocean, reaching the coastal waters of North America after about 5–6 years. Tentatively assuming a value of 10 PBq for the net 137Cs input during the first weeks after the Fukushima incident, the simulation suggests a rapid dilution of peak radioactivity values to about 10 Bq m−3 during the first two years, followed by a gradual decline to 1–2 Bq m−3 over the next 4–7 years. The total peak radioactivity levels would then still be about twice the pre-Fukushima values. My personal decision to abstain from eating ocean-born fish may be unfounded, however given the vast amounts of unknowns concerning bio-accumulation of Fukushima-Daiichi nuclear contaminants, I choose to err on the side of caution. There is substantial evidence that every inch of the Pacific Ocean will contain some remnant of the March 11, 2011 nuclear meltdown, and that those materials will negatively impact all those who consume it. The sustained release of radioactive water into the Pacific, FOR THE PAST TWO AND A HALF YEARS, is the greatest environmental disaster since the Cold Wars’ irradiation of the planet with 2,000 plus nuclear explosions. God save the people of Japan. Please be sure to check out ClimateViewer 3D, mapping out our planetary problems, in 3D! 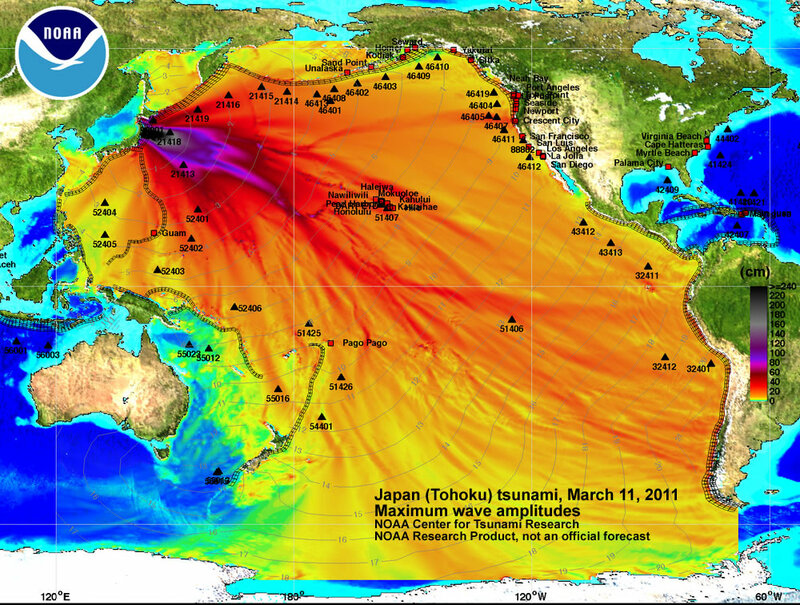 Ten Years of Fukushima Radiation Crossing the Pacific Ocean by Jim Lee is licensed under a Creative Commons Attribution-NonCommercial-ShareAlike 4.0 International License. Based on a work at climateviewer.com/. Permissions beyond the scope of this license may be available at climateviewer.com/terms.